I guess winter is already here if you are in the right place. For us, it is another week in the future, unless you want to call rain and wind in Desert Hot Springs at 60F “winter”. We have a few more days before we continue on the trek toward home and back to a real winter. Looking at the weather today for Klamath Falls, it is 20F with snow predicted. Remind me again why we are going back home? Full timers will laugh at us, but we are NOT full timers and have no desire to live “the life”. I love my hearth, my quilt room, my family close by. Thinking about this a bit in the last few days, probably because we are around the snow birds and full timer’s who snowbird south in the winter. I know lots of people who are doing the full time life and love it, but not for us. Thinking about why, perhaps, it isn’t for us. I used to want to do it, would daydream about it, but traveling for a few months at a time is plenty, and has reminded me why I love the roots of home with the freedom to travel. There is something about a familiar shape in the landscape, a ridgeline that I know, mountain peaks all around me that I can name and have visited in person that settles my soul. I feel “home” in so many places, but returning to a familiar landscape where I know the plants, the trees, the rocks, the soils, is as much a part of being at home as the familiar house and bed, books and sewing machine. For Mo it might be her workshop, a project to work on, something to fix that gives her that home feeling. I love our life just as it is. Still, I might like waiting a bit longer before returning to winter in Klamath Falls. Home is also about friends, but those friends do come and go. 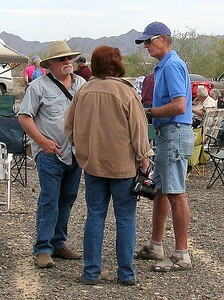 Wes and Gayle are friends who have shared many good times with us, both at home in Oregon and in Arizona. Since they at last sold their home in Rocky Point, it was important for us to get to Tucson to spend some time with them. Their home is so much fun to see. 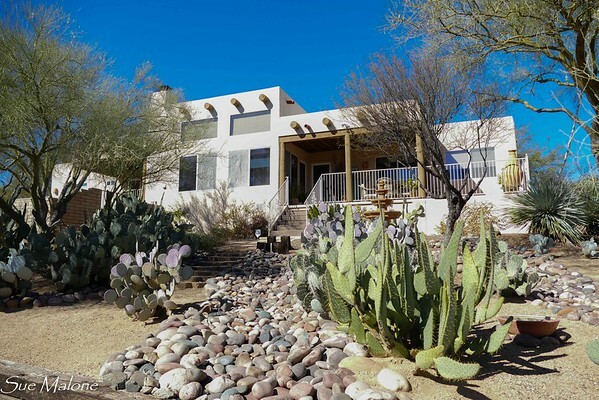 A lovely home, perfect for the desert, with wide views toward Madera Canyon on the northwest face of the Santa Rita Mountains, it is filled with Gayle’s artsy touch. We have been the lucky recipient of Gayle’s excellent entertainment skills for years, with wonderful cooking served in magical settings on dishes that match whatever meal she has decided to serve. 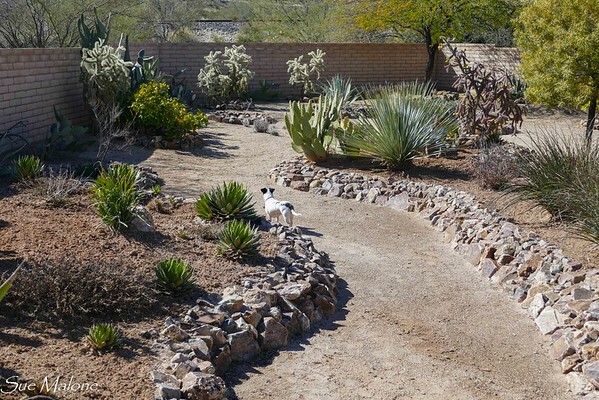 Tuesday’s lunch was no exception, and after lingering in the sunny dining room a bit, Wes took Mo outside to show off his beautifully landscaped desert garden. Mattie loved it too, with high solid desert walls that protected her safely from any critters who might try to eat her, and lots of spaces to explore. Later in the afternoon we drove up the canyon, enjoying the views, looking for birds and laughing a lot about the sillouhette of the infamous Elephant Head that I couldn’t see no matter how much I squinted. Takes a good imagination! Wes and Gayle had a great surprise planned for us that evening, and Mo and I thought it must be pretty good as we followed them in our car for almost an hour driving through Tucson. 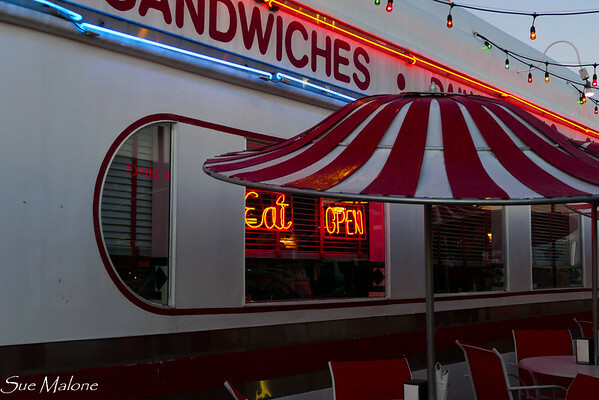 We were headed for dinner at Little Anthony’s Diner, where the hamburgers were big and juicy and I had an Orange Crush soda that was like stepping back into my childhood. 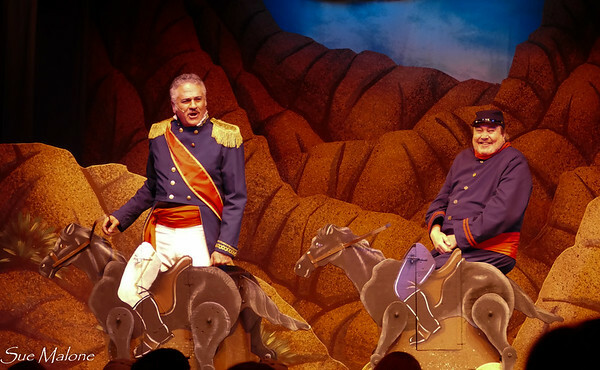 We thought that was the end of the surprise until we were led out the door of the restaurant to the entry to the Gaslight Theater, a Tucson institution for almost 40 years. We had no clue. The show playing was “The Cisco Kid”, and I haven’t laughed so hard in a very long time. It was just the kind of comedy that gets to me, a touch of really stupid slapstick with some hysterical audience asides and a bit of Saturday Night Live. The pianist was excellent, and got better as the night went on, and the songs were so funny. Broadway type songs set to rock n roll music with lyrics that fit the silly melodrama. We had so much fun with our friends. Thanks so much to both of you, Wes and Gayle!! With perfect weather in the forecast, we planned another day together on Wednesday, with our friends driving north to the park to have lunch with us before our planned afternoon hike. We enjoyed a few appetizers and set off. 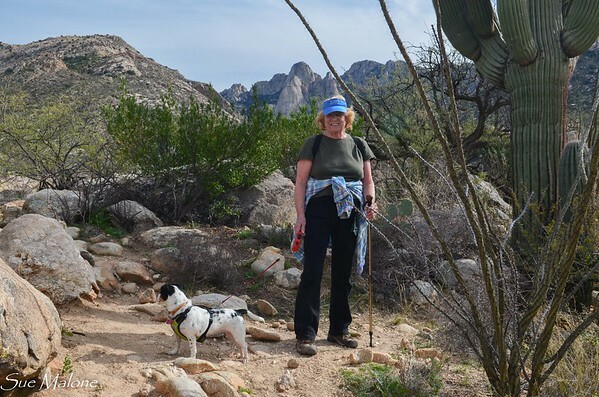 Our first hike was an easy one, walking from the campground along the Bridle Trail to share the Romero Ruin trail with our friends and Mattie. We went back to the rig after an hour or so, and decided to save lunch for later in the afternoon when we returned from the Romero Canyon Trail. 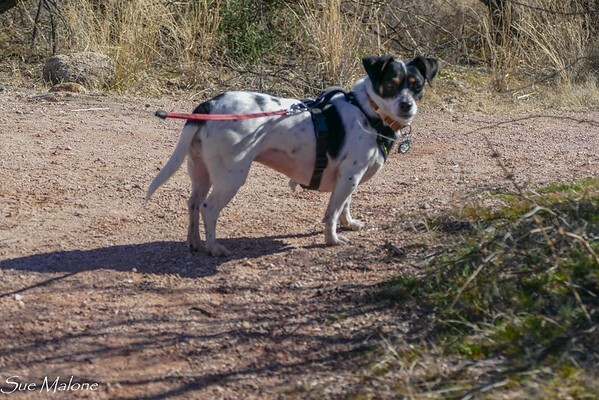 Mo and I had hiked to the lower pools on the Romero Canyon Trail in 2014, but we had Abby with us, and no dogs are allowed in the wilderness to protect the Bighorn sheep. We left Mattie to rest safely in the rig and drove to the canyon trailhead for the next hike. 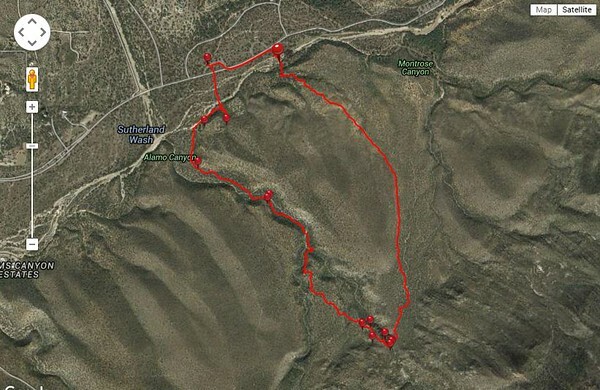 I had read that the hike to Romero Pools is considered a “moderate” hike. Probably would be moderate for Bobbie and Mark, but for the four of us, it was fun, but on the upper edge of moderate. After a little side trip to the lower pools, the trail gets progressively harder, with some fairly steep and rough sections as the trail approaches the crest. After the crest it is another half hour or so down to the pools. We enjoyed ourselves thoroughly, and probably could have managed the hardest part of the trail up the last switchbacks to the crest, but decided against it. So, no, we didn’t make it all the way to the pools. We laughed a lot with the people coming back down, with some saying it was worth it and others saying “absolutely not!”. Best part of the hike was the amazing views from the upper parts of the canyon. I suppose someday we will have to try again and find out for ourslelves, but I will go with a different frame of mind, ready for seriously rocky cliff climbing to reach the pools. Rough granite and gneiss, the bedrock in this part of the Catalina Mountains, crumbled and sharp, with lots of loose stuff isn’t my favorite. I’ll take Utah slickrock any day! After a few hours on the trail, we were all ready to enjoy our picnic lunch at the campsite with a cold beer to top it off. By the time Wes and Gayle waved goodbye it was almost dark. What a great way to spend a couple of days in Arizona. Just for you, Joanne, some face time for Mattie! 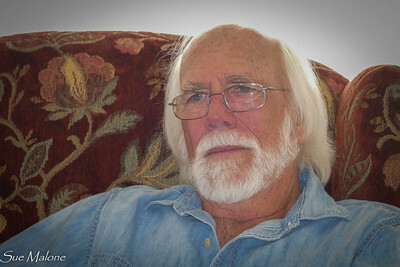 Writing requires thought, concentration, getting into the past rather than the present moment. I love writing, for me it is therapeutic, creative, fun. Except when I am trying to write and lots of other stuff is going on. Might be the reason the best writing shows up when I can’t sleep, and the posts are finally finished at 3AM. I don’t have that luxury this morning. 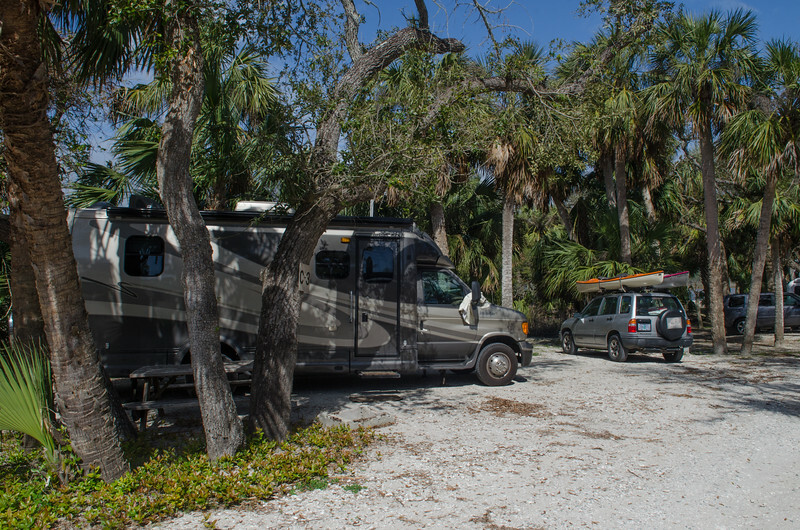 We are boondocking in the well recommended Ogilby Road area, with a wonderful campsite review by Nina that helped us to find our way after yesterday’s mixup. But then, I have yet to write about yesterday’s mixup. More about that later. For now, though, without the luxury of an expensive solar setup, I can only use the computers when the generator is running. Our laptops don’t have a very good battery life, so they need to be plugged in for any kind of extensive time online. Nina was right, though, our Verizon MiFi has five full bars here. I am trying to write while Mo is cooking breakfast for us, Daughter Melody is messaging me about some plumbing issues at the apartments, we are trying to track down the last person who worked on them, and figure out how to handle it all. Doesn’t make for good writing time. Mo is also trying to get the TV to work again. Every time we turn the satellite off, (when we turn off the generator) and then back on, we have to find the satellites again, and Direct TV seems to think it has to download the “guide” again, and even though the satellites are connected, the receiver can’t seem to “acquire” Crap! so much for a touch of news with breakfast during our morning one hour of generator time. This is why this post is all about “stuff”. I have to get the stuff out of the way before I get to the good parts. We had amazing days with our Tucson friends, lots to write about there! 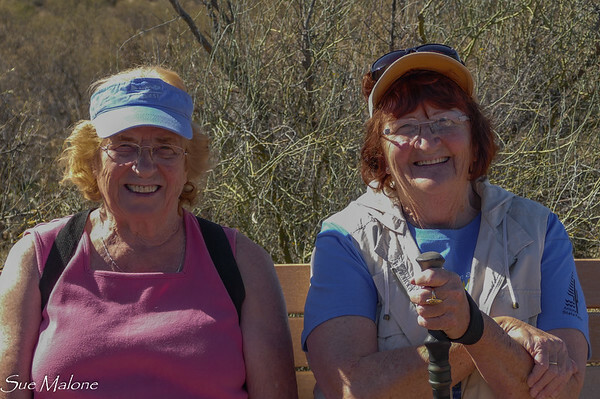 We enjoyed a fabulous hike once again when those same friends joined us at Catalina State Park for a day. I can’t concentrate on writing about all the lovely times and great things we did when dealing with distractions! I am the one who does most of the detailed planning for our trips. I use the same tools we all use, Streets and Trips, Google Maps, blog recommendations, Google Calendar. The Calendar is my lifeline, and I also have a hard copy printed out with all our plans on it. Which is why I can’t for the life of me figure out how I thought four days at Catalina State Park would start on Sunday night and end on Friday morning. Ha! Mo and I were feeling a bit stiff from our killer hike with Wes and Gayle on Wednesday, thinking how great it would be to have a lovely down day, doing nothing but some nice low key walks with the dog, maybe enjoy another great shower in the biggest shower stall we have ever seen, read in our chairs in the sun, maybe write a little and process photos from the previous two days. Perfect plan. Our tanks were a bit full, since I had been entertaining guests, I used a bit more gray water than normal and we decided to go dump the tanks a day before our Friday departure. Around noon we unhooked the MoHo and drove the short distance around the loop to the dump. Love that dump, it has a perfect angle and we get really good dumps here. Keep that in mind if you come to this park, the main dump near the entrance doesn’t have nearly the great angle. While we were finishing, a young woman came by asking when we planned to get out of our spot. “Tomorrow morning” I replied. “We have a full four days reserved and paid for”. She was sweet, and said oh I am sorry, they must have made a mistake. We laughed until a few minutes later the ranger came up and asked us again about our reservation. UnOh. I said, we have four days, and he said yeah…four days ends today at noon. Geez. I still don’t know how I managed to screw that one up! Mo and I were both incredibly embarrassed, and finished our dump in record time, went back to the camp and loaded up. We both have certain tasks that we do, nothing set in stone, but it just works out that way. Mo unhooks the satellite, I am the one to turn on the key and raise the jacks after the slide is in. We were working quickly. I turned on the ignition key, hit the store button for the jacks and suddenly heard a whomp and a yell. I had no clue, and opened the door saying, “You OK?”. No, Mo was NOT OK, she was in a heap on the ground where she had landed. Thankfully she didn’t break anything, and today only has a few bruises. She was standing on the step unhooking the cable when I turned on the key, and that automatically retracts the outside step. Mo said that she was frantically trying to get off the step and that having it suddenly disappear was a very weird feeling. Needless to say, she wasn’t that happy with me at the moment. Too many glitches! The ranger was incredibly nice to us, considering our screwup, and explained that he was so sorry, but there were no other sites available, as I said before this is a popular park and reserved far in advance. 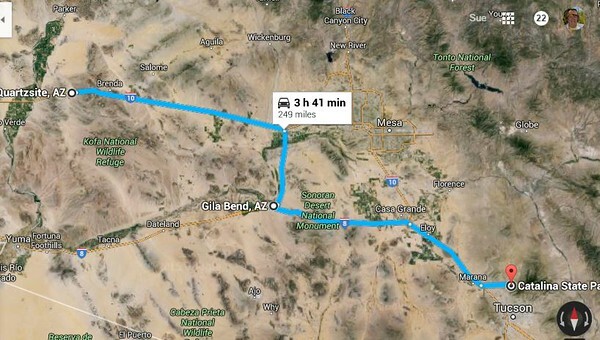 He did have a one night no hookup site for us, but we thanked him and said never mind, we wanted to go to Yuma anyway. Mo remembered to fill our fresh water tank, our holding tanks were empty, but in the rush, I forgot to add the gallon of water and black tank chemical to the toilet. Our total time to shut down and pack up the rig, and get out of our site was 17 minutes. We hooked up the Tracker and followed the same route out of town that we took into town. With just half a tank of gas however, I needed to find some of that really cheap gas in Tucson. Bypassing the major part of town, however, also bypassed the really cheap stations. We were happy to find fuel for $1.53 (with our RV Pilot/Flying J card 3 cent discout) at the Pilot on I-10 just before our exit to the 8 toward Yuma. It was late enough in the day that I was concerned that it might be dark when we reached Olgiby Road, so didn’t stop to refuel as we approached Yuma, didn’t think we had time. However, with only half a tank of gas, that gave us only a quarter tank for whatever generator use we might need in the desert. Plus, I had completely forgotten that we would be in California with gasoline a lot higher price than back in Arizona. So. We are here. We have plenty of fuel for running the generator, since it takes way less than a gallon an hour and we have at least ten gallons available. We never got our great showers yesterday, and my hair looks like some birds could be nesting there. Hopefully I have finished raving about all the glitches and when I start up the generator next time I can write a nice newsy post full of pretty photos and good stories about our wonderful friends and the great time we had in Tucson this week. I was excited about coming here. 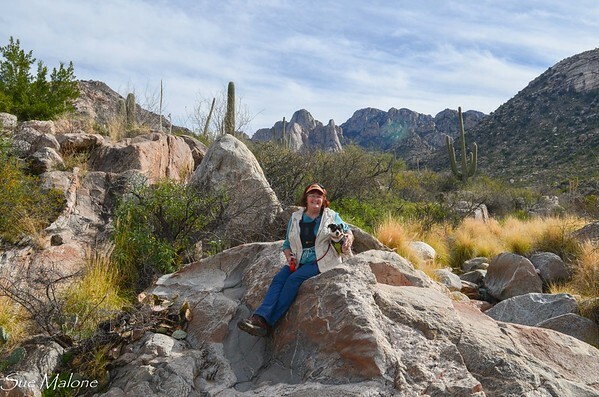 In January of 2014, while camped at the Family Camp in Tucson, Mo and I spent a day hiking in Catalina State Park. The skies were impossibly blue, many trails were dog friendly and after checking out the spacious sites in the campground, I wrote that I wanted to spend a week here someday. We managed to get 4 days, with reservations for this park almost completely booked up when we made the decision to travel to Tucson this winter. 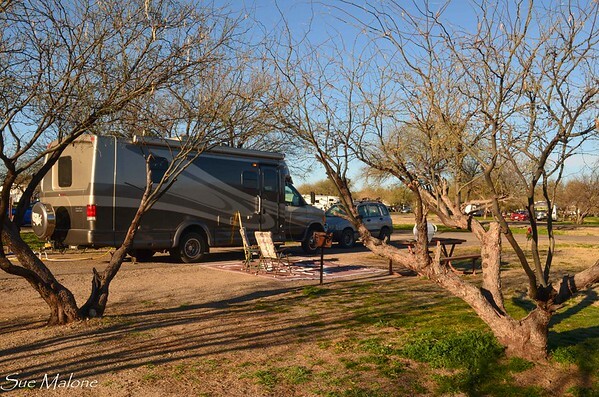 Both campgrounds are full, the A loop with no hookups, and the B loop, where we are located, with water and electric. We opted for a back-in site, on the outside loop for the privacy and the benefit of open space on two sides of the rig. 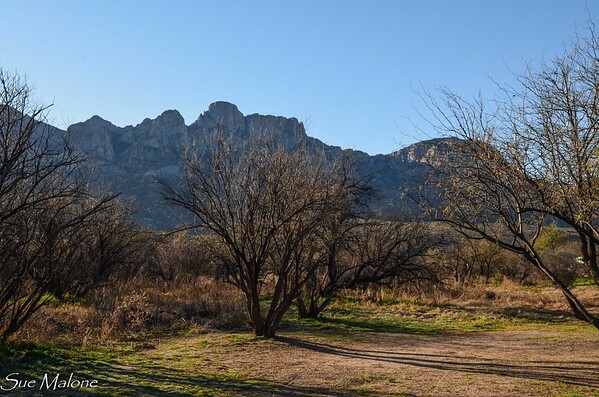 There is a miniscule visitor center at the entrance to the park, with a small selection of books and maps, tee shirts and a very nice 3d map of the Catalina Mountains, with park trails and other extended trails that lace this part of Arizona with some excellent hiking opporunities. What we like most about this area is the variety. You can hike easy flat trails for birdwatching, several nice loops with different levels of effort, and always the tougher trails into the wilderness, where the management of the Big Horn sheep population is priority. No dogs in the wilderness, but there are plenty of places to hike outside the wilderness boundary that are dog friendly. What I had forgotten about this park is how useful the bikes would be here as well. The park roads are wide and meander through the landscape. It would be a nice place to ride. We didn’t bring the bikes or the kayaks on this trip, but if we come here again, we will be sure to load up the bikes. When planning the trip, friends and hikiing were the prioriies, so no bikes on the rig. We arrived after a nice drive from Quartzsite, meandering along I-10 and turning south toward Gila Bend and I-8, avoiding the Phoenix traffic. Catalina SP is on the northern edge of Tucson, so we avoided Tucson traffic as well, and pulled into the park mid-afternoon. The funniest thing of all about this place is how lovely, quiet, and remote it feels. Especially considering that just west of the park entrance is a very large mall, with Red Lobster, Olive Garden, Best Buy, a bunch of other stuff, and a very giant, almost upscale WalMart, with excellent ambient music piped into the parking lot. So while camping in a lovely park, with open spaces and a magnificent view of the Catalina’s to the east, it is easy to slip over to the mall for any necessities. We have Direct TV, set up at the cottage in Grants Pass, and only one receiver. In the upgrade process involved in moving our TV service from Rocky Point to Grants Pass, we only had the option of getting an HD receiver. Our King satellite is compatible with it ,even though we only get SD, but the new receiver only has an HDMI outlet, and we were at a loss as to how to get the TV and the receiver to talk to each other. We neglected to try out the new combination back in Grants Pass before we left and hadn’t tried the new TV, satellite, receiver combo till we got here. Thanks to WalMart we were able to buy a simple sd three prong cable but still couldn’t get the TV to see the Direct receiver. I can’t even explain the very long process spent on the phone with Direct TV trying to communicate our problem, and how we could fix it. You wouldn’t believe all the answers that didn’t work that we got from the various technicians. Now for the best part. Remember that channel 3 channel 4 thing? That thought came to us in the middle of the night, and sure enough it was as simple as that. We now have TV if we want it. Not a lot, but enough to hear about a bit of what is going on in the world. We also had some issues with our semi automatic levelers. No matter what we tried, we couldn’t get the back left one to drop down. It wasn’t much of an issue at Catalina spa or Quartzsite, but even though the sites here are reasonably level, we really needed our levelers, with the left side too low for comfort. So Monday morning, we were a bit unlevel, had no TV, and then when we turned on the water, we had no water. Without paying attention to the weather forecast, and our outside temperature showing 33F, we didn’t think it could have frozen. Wrong. Frozen at the inlet, so we unhooked the hoses and turned on the house water which worked just fine. We have since unhooked the water every night, with temps ranging as low as 28F in the early morning. Our first full day here was a bit overcast, but in the low 60’s. Perfect for hiking. We set off to explore the Romero Ruins with Mattie. 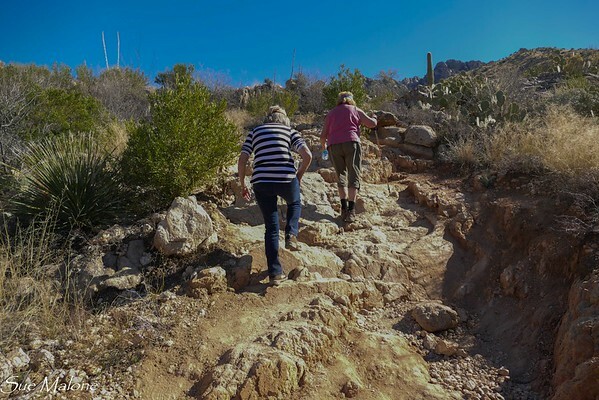 It is a nice short hike across the seasonal stream which had a bit of flowing water, up the hill to the terrace overlooking the Oro Valley. The terrace was home to the Hohokum people around 1,100 AD. They grew crops in the fertile valley below, and hauled their water up the slope to their small village above the flood zone. Hmmm, people smart enough to not build in a flood zone! 1000 years ago no less. The ruins are simply small stone walls, but the signs and documentaion of the work done in the area do an excellent job of explainiing what was once here. In addition to evidence of the people from 1,100 years ago, there are also middens that suggest occupation around 500 AD. 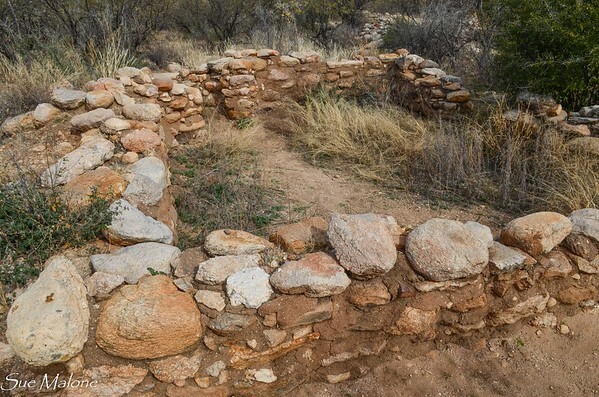 The latest site in the area is the Romero Ruin, a ranch built in the mid 1800’s. The history of this area is quite complex and interesting. 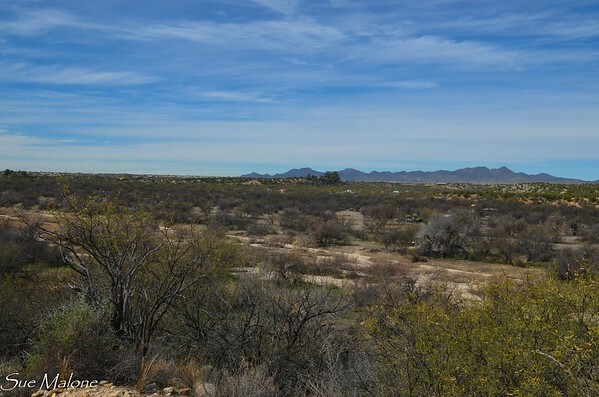 Lots of archeaological sites are being studied in the Tucson area with more and more discoveries all the time. 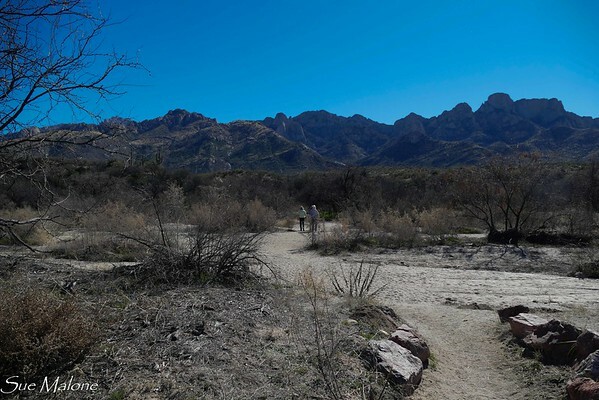 As we descended from the Romero Ruin loop, we spied an unnamed trail meandering off to the southeast toward the mountains. What the heck, let’s check it out. It would be almost impossible to get lost with the mountains to the east and the highway to the west, so I wasn’t concerned that we didn’t have a map, a gps, or a phone with us. Hiking up toward the base of the canyons, we ran into some people who said if we continued, we would come to water in another half hour. Wow, canyon pools and waterfalls! We continued southeast on the fairly easy trail. 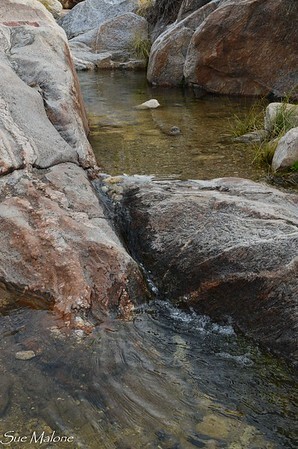 Finding the pools and the beautiful water smoothed boulder was a big treat. A few people were returning from the pools on the route we had just finished, and they told us that if we crossed the pools there was trail that continued along the south side of Alamo Creek back down to the main road of the park. Whoopee! Nothing we love better than a loop hike, so we found the trail, and hiked down the creek, crossing it several times, before we ended up right on the park road, just a quarter mile or so south of where we had parked the Tracker at the Romero Ruin trailhead. Later I found out that this unmarked trail was called the Alamo Canyon Loop, and isn’t listed on the state park trail map, but can be found online in a few places. Great fun. By the time we got back home, Mattie was ready for a rest. I think we hiked a bit over 5 miles, including the 3.5 miles on the Alamo Canyon Loop and our meanderings around the Romero Ruin. I still have the FitBit in a plastic bag in the computer case. I suppose I need to get it out and get it up and running again! I had a steak that we planned to split for dinner, and suddenly thought, “Where is the BBQ?” I have only one WeberQ, and we will pack it back and forth between Rocky Point, the apartments, and Grants Pass. We use it in the rig and at home. I really want to get one for home, so we don’t have to keep packing the thing around, but so far haven’t managed it. Mo put it in the Lexus when we drove from Klamath Falls to Grants Pass, where it should have been transferred to the Tracker for our trip. Oops. We laughed when we figured out that the much loved and used BBQ was still sitting in the Lexus parked safely in the MoHo shed at the cottage in Grants Pass. So no bbq’s on this trip. Instead, I pulled out our trusty little miniature Foreman Grill, and it did an Ok job on the steak. Little glitches are funny, and can make us laugh a lot. The last little glitch that unglitched happened that evening after the hike. I attempted once again to level the rig as best I could with only three levelers, and suddenly the left rear light went on and the leveler dropped to the ground. Perfect. We have TV, water, and are nice and level. We lost of couple of important things and then found them. Funny how things can be troublesome and then simply smooth out without any real effort on our part. It makes it easier to let go a bit when there are problems knowing that sooner or later they will eventually get solved. Although I do have to say the problems we have encountered so far are pretty small and petty, not really big ones like some of our blogger friends have had to deal with. 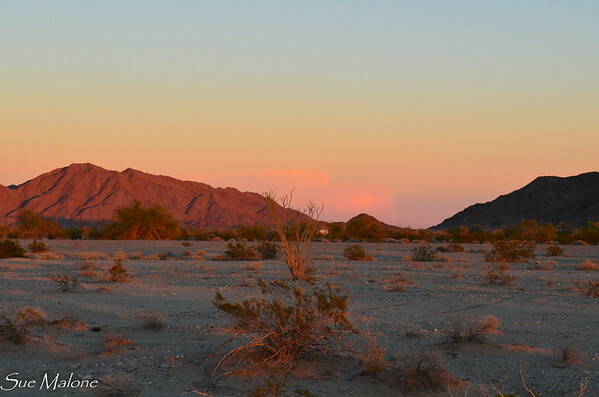 A good day in the beautiful Sonoran deserts of the Southwest. 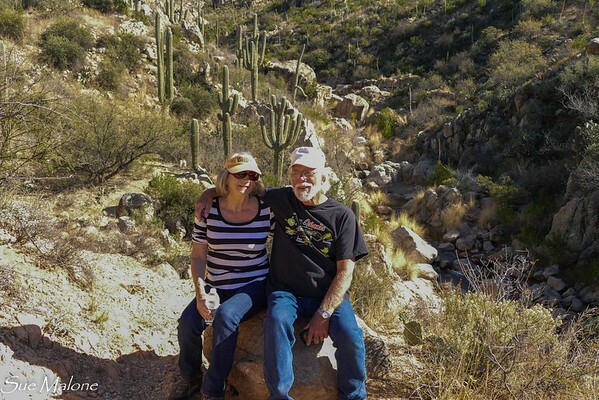 Tomorrow we will spend a day and evening with our friends and one time Rocky Point neighbors, Wes and Gayle, who live south of Tucson in Sauharita. Rumor has it they have some surprises for us! 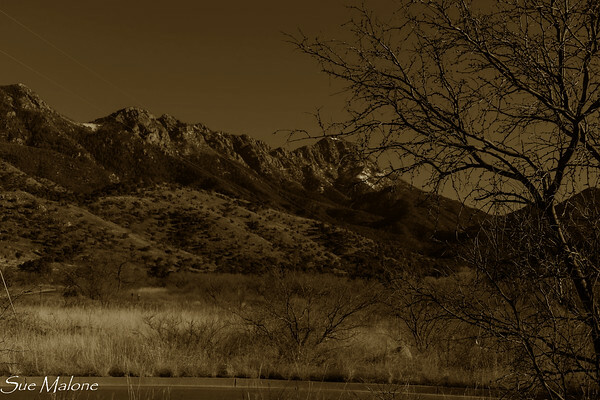 Current Location: Catalina State Park north of Tucson Arizona and it froze this morning! When planning this trip, I knew that there was a Saturday event in late January that I didn’t want to miss. 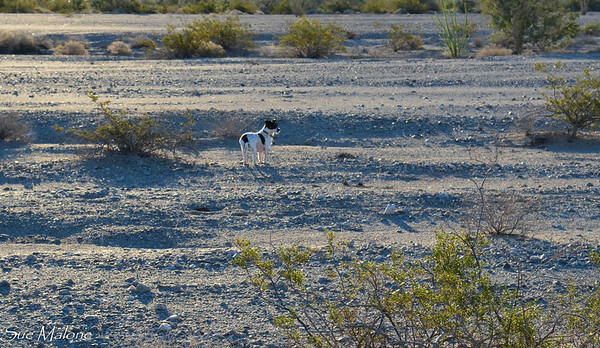 Mo and I have been to Quartzsite a few times, usually just for an overnight, and sometimes simply a drive through. The big crowds don’t excite us and shopping isn’t high on our priority list. However, meeting some of my favorite fellow bloggers was on the bucket list, and the Blogger Fest was a great way to at least get a start on that list. I have no problem being social, but large group happy hours aren’t big on my list, and my idea of a perfect group is 4 or at the most 6 people including us! Big groups are a bit intimidating, simply because I don’t like to intrude on conversations that are already happening. Still, time to get outside my comfort zone and get out there, so we planned our trip accordingly. I had no idea who would show up, except of course for Our Awesome Travels George and Suzie, who organized and promoted the whole thing. Thanks so much, George! 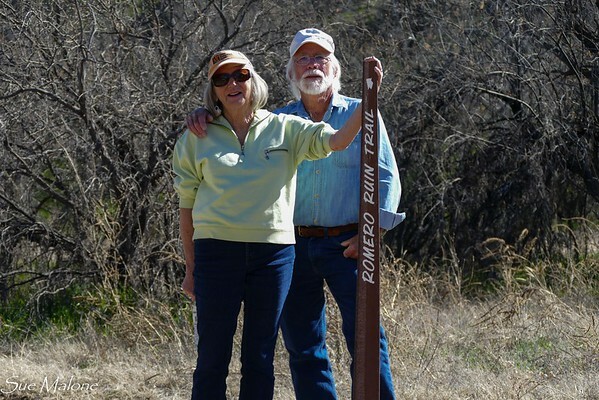 Had been reading Bayfield Al’s blog and figured he wouldn’t be there, and couldn’t imagine that Box Canyon Mark and Bobbie would stop hiking obscure canyons long enough to show up, and Suzanne? Well, geez, she is usually off hiking somewhere too, and I didn’t expect to see her either. What a treat!!! Some of my very most favorite bloggers were there, big as life, and for me it was such a treat. We also had a chance to meet some bloggers previously unknown, and uhoh…some other bloggers that I read in the past that somehow slipped away from my following list, I have no idea how. In spite of the fact, that like many others I spoke with, I am taking less time reading blogs, I now have added some new blogs to the list, catching up on the lives and happenings and travels of some new friends as well as old ones. Like others said, though, a big group like this isn’t exactly the place to have long in depth conversations with friends, especially brand new ones. Too many people to talk to, and the conversations are the kind that touch the surface, the hugs and handshakes are solid and real, but the real conversations start later, at a campfire, or even more so, on a hike or a walk somewhere. I really hope that I get to share some of those campfires, hikes, and conversations sometime in the future with several of the people I met in person at Blogger Fest. It is a great starting point. Sadly, I didn’t take the camera with me while walking around, so only got a few good photos toward the beginning of the gathering. If you click on some of the links you can see a lot more photos of the gathering from the perspective of the photographers who did a lot better job at catching the whole thing than I did. 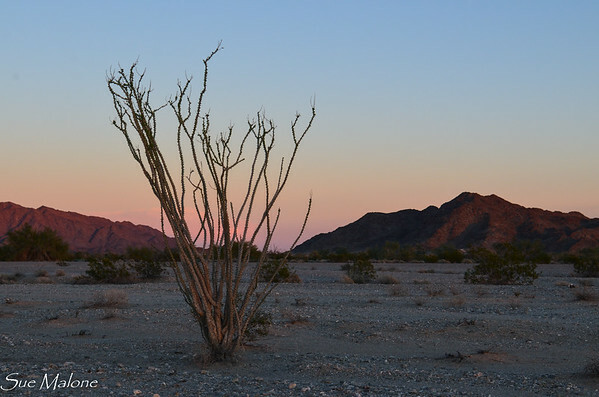 Our original travel plans included a boondocking night at Joshua Tree, but we decided that we should instead bite the bullet and spend two whole nights right there in Quartzite. Worked out perfectly. 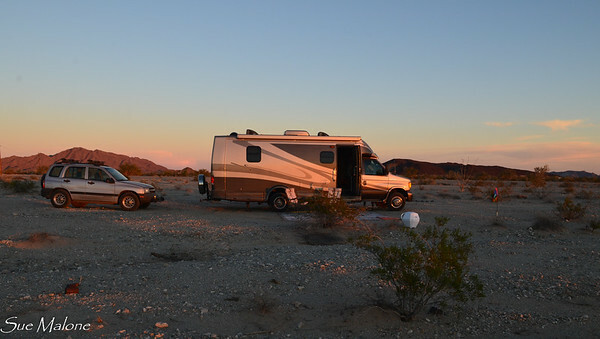 We camped at the Roadrunner free BLM area about 6 miles south of town. There were lots of rigs scattered about, including a large group for something called QuartzFest. These folks had HAM radio stickers and a LOT of ATV’s. It was a big crowd. 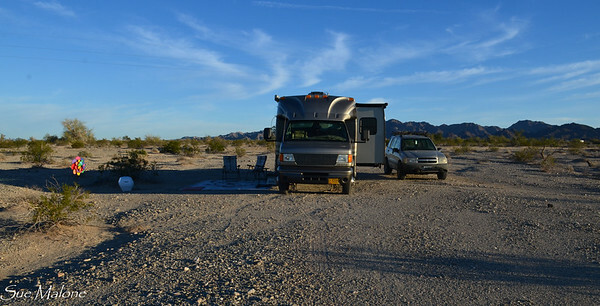 We parked the motorhome and drove farther into the desert with the car, and just about a mile in we found a perfect spot. Nice fire ring, interesting gully east of us and no rigs in sight in that direction. The mountains to the west made a perfect sunset sillhouette. Only a bit of generator noise as darkness fell, (including our own) and then all was quiet for the rest of the night. Saturday night was exactly the same, dark and silent except for the gorgeous full moon that brightened the landscape. 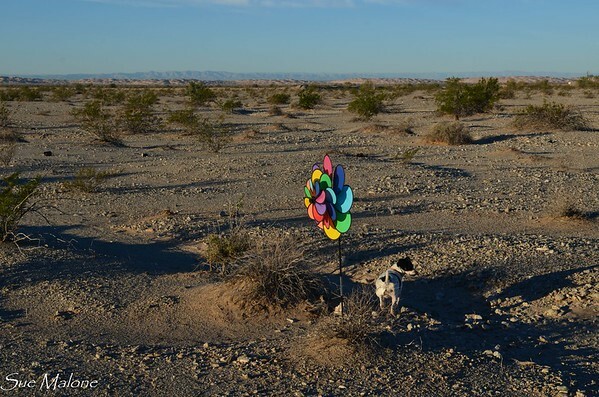 Arriving on Friday afternoon, losing an hour to the Arizona time zone, we were still able to check out downtown Quartzsite and explore Gem World. I love this big store, with rows and rows of crazy stuff for beaders, jewelers, wholesale buyers of stones and fossils, and all in one place, with a roof. Surprisingly, the prices were similar to those we saw the next day at the Gem and Mineral Show. I had a request from daughter Melody for some “rocks from Quartzsite” so I found some goodies for her at extremely reasonable prices. It was fun. There is something about the desert, this desert in particular, that smells and feels wonderful. Even with all the people and the generators and the dust and noise, it is still the desert. In winter there is not a better place to be for the price. I guess that is why so many people are here. In spite of all the people around Quartzsite, the roads in town were quiet on Sunday morning. Before the Blogger Fest we decided to check out the big tent. As Merikay said in her post, it is much like visiting a state fair, with an RV theme. Lots of vendors with lots of stuff, much of it quite expensive. I got sucked in by some cool little microfiber cleaning pads that really do work, and a flat rubber broom that actually gets dog hair up from the carpet in addition to sweeping the tile perfectly. 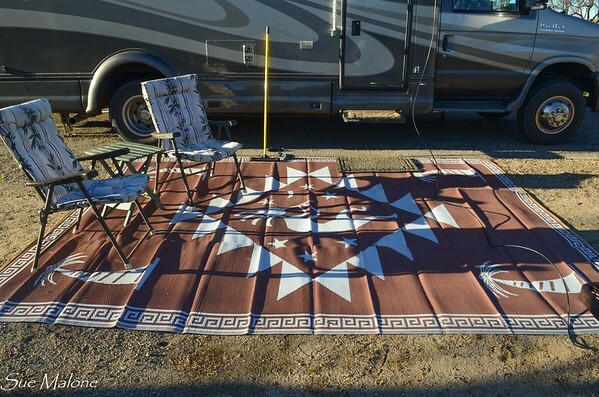 Mo found a well priced 30 amp cord to add to the one we have for those places that are just a bit too far out of reach, and we opted to buy a 9x12 woven mat for outside. Both our smaller mats that we have used are wearing thin. The new one is great! It even has grommets where Mo can tie it down so it won’t blow around. I know almost everyone already has one of these, so maybe we were the last holdouts. We solved the expensive food problem by sharing a single five dollar hot dog, and yes, it was definitely a mediocre hot dog, not your $1.50 Costco wonder. We then found a booth for Adventure Caravans, the company we signed up with just recently for our Rose Parade adventure next year. In addition, Countryside was at the event, all the way from Junction City, Oregon, the place where we had our dinette installed. It was fun to walk into the booth as the vendor was talking to a customer and rave about their fabulous service. They probably thought I was a paid shill. Best of all, the maker of our StowMaster tow bar, RoadMaster, had a booth and the vendor there told us to go find their service bay at the back of the lot to get our tow bar cleaned and lubed for free. Nice service. The guy who helped us was quite happy with our bar, saying the serial number showed it to be at least 20 years old, and after a good inspection, he told us it was probably ready to go another 20 years. He said it was the best tow bar that RoadMaster makes, although some people don’t like it because it attaches to the car rather than the RV. Works fine for us since our Tracker is used mostly for traveling anyway. Probably wouldn’t want it on the Lexus at home. Ha! But we wouldn’t ever tow that car anyway! After our shopping excursion, and Blogger Fest, we ambled home to relax and enjoy the beautiful sunset and quiet evening. I don’t have any kind of WiFi booster, so my Verizon signal was good, with 3 bars or so on the MiFi, but the internet wasn’t happy and I had a hard time loading anything. We also don’t have solar, so running the computers requires running the generator. My computer plug isn’t happy with whatever voltage is coming through our outlets when the inverter is working, so I tend to avoid it. Hence a post today and not earlier. Today we are in Arizona and have plenty of power to process photos, upload them, and write a blog. It was great to see everyone, to meet new friends and old friends, both real and virtual. I hope this gathering keeps growing and bringing in new folks. This is how our day began yesterday and the day before. Well, not technically I guess, since each day actually began before sunrise with a swim in the pool. As Mo and I swam slow laps in the dark, we laughed about how people lolling about the pool say they “went swimming”. So we did go swimming, but we also “went to the pool”. With the water a luscious 95 degrees, you can simply lie around, float a bit, do a slow backstrock while watching the stars and call it swimming. I have no idea what the mineral content is for this water, but it doesn’t have sulfides, so no smell. I think there must be something in there that helps with bouyancy too, because I really can lie on my back and simply float while I watch the sky. Not a bad way to begin a morning. Sometimes we wait for the sunrise in the pool, but yesterday I wanted to try to get some photos. I am not willing to haul the camera to the pool, so we walked back home (the MoHo is maybe 150 feet from the pool entrance) and I grabbed the camera and was just in time to catch the best of the color. Mornings are simple and lovely, with french press coffee, a walk with the dog, a little bit of news, checking email, simple routines that are reminiscent of just about anywhere we might be in the morning, but warmer, with muscles loosened by that lovely swim. I love being here. The days are beginning to run together already, and there haven’t been that many of them. On Tuesday, I made my annual pilgramage to two Coachella Valley quilt shops that I love. Funny how each store is so different, with different styles and different offerings. I found all the lovely teal and turquoise colors that I searched for in vain back in Oregon last year. Our Rocky Point quilt group searched for these colors in vain for this year’s opportunity quilt and finally had to settle for something a bit different. I now have several yards of the gorgeous stuff, but who knows when I will ever need it. Only fabric collectors will have a clue what I am talking about. We returned from the town trip to relax a bit, and I wandered around the park taking photos of the skies, and of the people. There were quite a few folks in the “lower pool”, the one designated adults only, and many more in the “upper pool”. The upper pool is bigger, and a bit cooler,allows kids, and is filled most afternoons with many people playing water volleyball. I also noticed that most of the people around the pools must have been here awhile, their nut brown tans a dead giveaway. Yesterday, after our morning swim, gorgeous sunrise, and a dog walk, Mo and I piled into the Tracker with Mattie and headed for Temecula and Murietta. We had traveled the Palms to Pines Highway before, but last time, instead of going toward the west, we drove north through Idylwild and down the crazy mountain road into Banning. This time we turned south and west at Highway 371. We both love it when we manage to find a new highway that we haven’t traveled, and after a some reminiscing, we decided that this was a new road for us. We had a better reason than simply finding quilt stores to make the 2 hour trip. 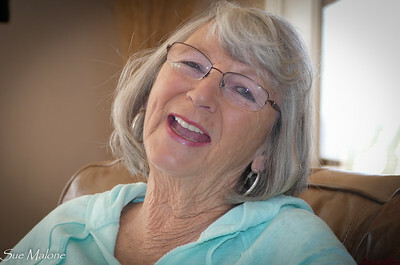 Judy is wintering at the Escapees Jojoba Hills Resort, and we wanted to stop in and say hi and check out her new digs. We were also looking forward to the burgers that Judy offered to bbq for us. The other back story is that we really needed a big dog to wear Mattie down a bit. She and Emma are good friends, and we looked forward to Mattie having a playmate for a bit. Funny, here at the park there are a lot of little dogs, but many of them aren’t the least bit interested in playing with Mattie, and some of them are downright grumpy. Once there was a little terrier, just about her size, that managed to keep up with her and they had a good time. But most of the time, Mattie just has to look longingly at the other dogs while they cross the street to avoid a confrontation. For years I have heard Rick’s Paulette talk about Primitive Gatherings, and wanted to check it out. We found the shop, and while it was quite lovely and very amazing, it was also completely overwhelming to me. Paulette’s thing is wonderful wool applique, and it is beautiful. And incredibly expensive. I actually managed to get out of the shop without buying a single thing. No need to start up an entirely different aspect of my quilting hobby. All those low key muted colors are lovely, and the wool is soft, but I am drawn to the crazy bright world of wild color, and decided I didn’t need to get caught up in the new trend. We drove through Old Town Temecula just to say we did. The streets were tight, with the usual smattering of touristy shops and a large array of eating and drinking establishments. Might have been a nice place for walking if we hadn’t other plans on the agenda. I did manage to find a very long and well done mural at the far end of town. Funny thing about that mural is that a big part of it is behind a building/restaurant/bar or something, with only a couple of feet between the building and the mural wall. We couldn’t figure out if the mural was painted before or after the building went up. After a bit of internet searching about the mural, I did figure out that the “old west” building that is right next to the mural was put up after the mural was painted. Bummer. If you check out this link, there are photos of the balloon part of the mural before the tasting room was built right in front of it. The other funny thing was the wonderful old courthouse. When viewed from the front it looked great, but as we were returning along the freeway and saw the view from the back, it seems that much of it is a huge parking garage. No clue, and don’t really care enough to go back to pursue it. Temecula is a place we can say we saw and don’t really care to see again. Cute and all, but so very SoCal. Sorry to my SoCal readers, but I did have a reason for leaving back in the 60’s. Not my style. On our way back east on Highway 79 we rounded a corner to see a huge gathering of rusty metal sculptures…looking a lot like the ones that we photographed at Anza Borrego. We pulled in to look at them, and a nice looking man and his big friendly dog came walking down the hill. I was surprised to discover that, Yes, it WAS the man, Ricardo Breceda, creator of the famous desert sculptures. 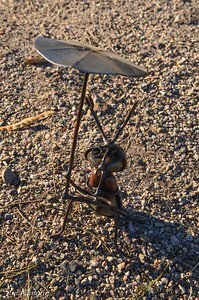 I somehow envisioned the artist as a reclusive guy off in some artist world, not walking down the dusty hills along Highway 79. I also didn’t envision being able to buy a little sculpture made by him for five bucks. We opted for the cute little ant rather than the amazing horses that sold for $1500. Or the giraffe for $2000. With the prices of art and sculpture usually through the roof, these seemed like incredibly reasonable prices for amazing yard art, although I have no idea how I would get one home. Continuing up the road to Jojoba, near the little town of Aguanga, we saw Judy waiting for us at the gate in her nifty little golf cart. After driving around the resort, it is obvious why most people who live there have a little cart. That place is hilly! Judy took us to the lemon trees, where we were told to “pick all you want”. We then took the dogs up to the distant dog park. There are two, but the distant one was more likely to be less crowded, and it was, with only Emma and Mattie to enjoy it. Laer, when we returned to Judy’s rig, the two of them kept us entertained on Judy’s extensive patio while we enjoyed our yummy burgers and conversation. Can you see Judy waving bye to us? It was important to get back on the road by three so that we could travel the narrow winding road back to the valley before dark. There is a great overlook that we had seen on the way up, but it would have required a very scary left turn across traffic to enter. Don’t try that! Much better to check out the view at the overlook as you drive down the hill, not up. Love these high views across the wild landscapes of earthquake country, with the rumpled ragged hills in the distance marking the San Andreas Fault as it snakes along the upper edge of the Coachella Valley. And NO, Judy, you don’t want to drive this route with your motorhome!